The best-selling SUV in its lineup, the 2012 Chevrolet Tahoe is a more affordable -- and 20-inch shorter -- sibling of the Suburban. Save for less cargo space and a slimmed-down wheelbase, it, too, can seat up to nine and offers the same impressive comfort and convenience features as the Suburban, along with its flex-fuel V8s with cylinder-deactivation systems. Third row seating sure, if you do not have more than one car seat that is. I purchased my vehicle used so with that comes little issues that purchasing a brand new car wouldn't have. For instance, the door handle is broken, so whenever I go to open or close my door I can feel the broken piece split a little while pulling my door closed. It is annoying but there is an option to fix in the future. I really love how much space there is in the back of the vehicle when I remove the third row seating-I can fit all my groceries and then some. Something annoying about the second row seating and having car seats is that the anchors for the car seats are located on the middle and one out seat. So, I can have my car seats strapped into those two spots but if I want to use the third row seating, I would have to move the outer car seat to the seat that does not have anchors in the second row. That to me makes that third row seating kind of obsolete because I feel like anchors are really the safest option for car seats and moving my son to a different spot is not really an option (to me). That has to be one of the most frustrating things about this Tahoe. Safe, secure, high tech and comfortable! My husband talked me into buying our Tahoe and it did not disappoint! We have had absolutely no problems with it. We are a family of five, so we are very comfortable in it. There's plenty of room and we do not feel like we are crammed in together. Even though it is roomy, I do not feel like I am driving a bus, which I thought I would. I love the alert features that let me know important things like the air pressure being low in a tire. The notification even tells me which tire it is. My favorite thing about my Tahoe is how safe I feel in it. I have always had a car and have felt vulnerable out on the road. Our Tahoe definitely gives me the confidence I need when driving around with my family. 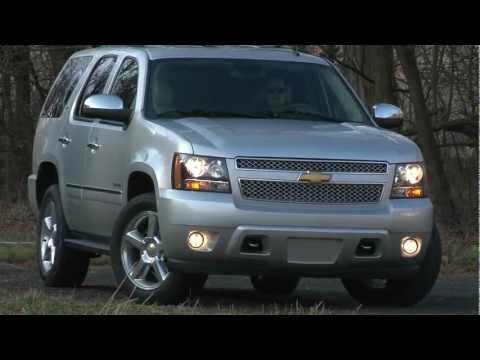 2012 Chevrolet Tahoe ltz features and comforts. I have zero problems, the performance and reliability is topnotch. Comforts are heated and cooled front leather seats along with a heated steering wheel, heated rear leather seats and third row seats. Back up camera, blind spot indicators on both sides, overhead DVD with headphones and a remote, DVD in the dash when parked. Bluetooth for telephone, usb, AUX inputs for the stereo. XM satellite radio and OnStar. Rear door open with the push of a button from inside or from the key fob which also works the remote start. Push button cruise control, factory alloy wheels, factory tinted windows, 5. 3 Liter v8 with an automatic transmission. This is a great automobile to own, no complaints. General Motors LLC (GM) is recalling certain model year 2010-2014 Chevrolet Tahoe Police Pursuit vehicles manufactured August 24, 2009, to December 1, 2013. The affected vehicles, equipped with special equipment options for police or government service, may experience corrosion of the under-hood cooling fan assembly due to fluid intrusion, which may result in an electrical short circuit. A short circuit increases the risk of a fire. GM will notify owners, and dealers will replace the fan motor and shroud, extend the wiring and re-orient the fan motor to reduce the risk of corrosion, free of charge. The manufacturer has not yet provided a notification schedule. Owners may contact Chevrolet customer service at 1-800-222-1020. GM's number for this recall is 16145.